Scooper - Technology News: What is the marine heatwave - the so-called 'blob' - that is causing global climate chaos? What is the marine heatwave - the so-called 'blob' - that is causing global climate chaos? Off the Pacific coast of America there is a phenomenon that has caused birds to fall dead from the sky and deceased whales to wash up on the beach. It has become known as the “blob”, an area in the northern Pacific Ocean that experienced above average temperatures during 2014 and 2015. The blob is a marine heatwave, an extreme and large-scale warming where temperatures in the ocean are unusually high. Marine heatwaves have been documented in both the Northern and Southern Hemispheres and range in intensity and duration. The Blob, which stretches from Mexico to Alaska, is possibly the largest marine heatwave ever recorded. During 2014 and 2015, the ocean became three degrees warmer than normal, causing widespread death and destruction to marine life. Many sea animals such as sea lions, whales and otters washed up dead or starving on beaches along the coast, and there was a mass death of seabirds. Meanwhile, toxic algae flourished, causing further damage to the ecosystem. Despite the water temperature eventually returning to normal, the ecosystem after a marine heatwave is severely disrupted, sometimes permanently. In south-west Australia, for instance, a ten-week long, 3-5 degree Celsius warming of the sea in 2011 caused a 100 km stretch of sea kelp to die. While sudden changes in water temperature have been recorded in waters off the Western Australian coast in the past, there have been no previous records of such strongly elevated temperatures . During the heatwave, the area became home to species of both animal and plant life more typically seen in subtropical and tropical waters, which prevented the sea kelp from growing back. In addition, while widespread mortality of fish and invertebrates were reported, none were shown to be attributable to disease. There were widespread reports of fish kills and of tropical species being found further south than their normal range. “The heatwave combined with decades of ocean warming have broken down long-standing biogeographic boundaries with lasting consequences,” said a paper published in July by a team of scientists led by the University of Western Australia. Scientific research in this area is fairly new, indeed, the term “marine heatwave” has only been in use for the past few years. The question scientists are asking is whether global warming is at the heart of these oceanic events, or other factors . According to some, marine heatwaves have been observed around the world and are expected to increase in intensity and frequency under anthropogenic climate change . 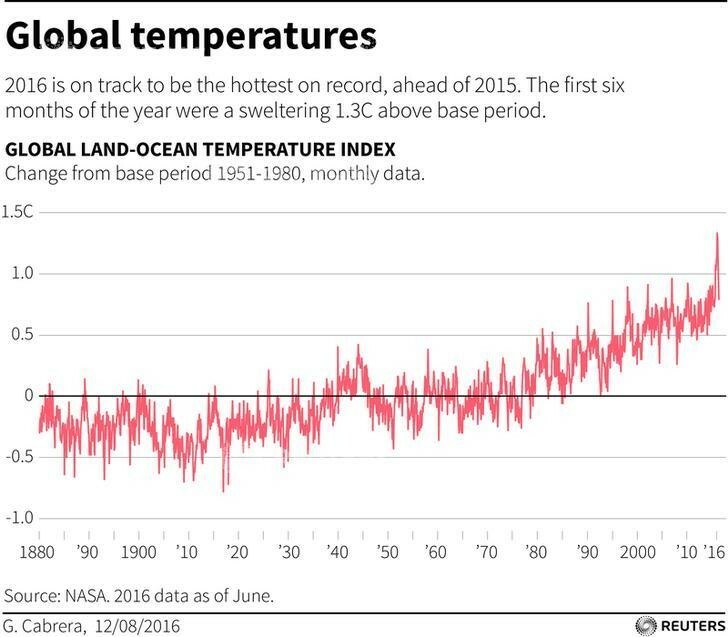 Indeed, this year is on track to be the hottest year on record, with the first six months of the year alone recording a 1.3 degree Celsius rise in temperature.